Good until Monday at 11:59pm ET or earlier if sold out [unlikely] you can get the new condition Westone W60 in-ears for $500 with free US shipping at B&H Photo. As of the time of writing, this item is restricted to USA shipping addresses [not sure why]. Optionally, for $50 more, you can get it bundled with the Weston bluetooth cable ~ click on the green “Build Bundle” button on the right hand side of the page (on a laptop screen), and/or you will be prompted by the offer in the shopping cart. Another Massdrop headfoolia offering that came out of the gate strong. It is already fully unlocked with 5+ days to go [from blog-posting time]. “It” is not the Stephen King “It” but the new condition Tenhz P4 Pro IEMs going for $80, shipping in mid-December from Massdrop itself. There is no mention of warranty in the listing. It’s Ultimate Ears time at Massdrop and it’s already fully unlocked! It is the new condition Ultimate Ears UE900s IEMs going for $175 with free US shipping. The offer runs for the next six days and change (from blog-posting date). These quattro balanced armature IEMs have MMCX connectors and come with a 1-year manufacturer warranty and will be shipped from Massdrop at the end of the month. All sales are final as usual at Massdrop’s. Flagship Final Audio Design fans unite and take over! The new condition currently go for $999 at Amazon, but if you are comfortable with used, they are available in “Used – Like New” (damaged original packaging) for $636~ with free shipping by Amazon Warehouse Deals actual. They come with a 39-day satisfaction guarantee, so as long as you will have the time to test them thoroughly during those 30 days, then you can reduce your short term risk with buying used. More eBay action, the Sonix Electronix eBay store is offering the new condition Westone TS1 BA In-Ears (balanced armature) for $39 with free shipping and handling. You can buy as many as you like. It is turning into a Phiaton day today with two parallel offers for the MS 300 balanced armature hybrid earphones. At NewEgg, promo code 0725EBTS31 drops the price from $100 to $40. The offer has been extended by a week. If you are a fan of budget-priced balanced armature earphones, the new condition Phiaton MS 100 BA earphones are on sale for $30 with free shipping at Amazon by Amazon actual with a limit of up to three units per customer. There, they average 4 out of 5 based on 38 customer reviews. Based on the pictures, this looks like it has a 1-button remote. More earphone action, this time it is the new condition Nuforce HEM4 In-Ears, in the blue color scheme, going for $140 with free shipping, with a limit of up to three pairs per customer at Amazon by Amazon actual. These are balanced armature too with dual drivers. Picture #4 over there shows the loaded accessories kit that is included with the item by NuForCe. More armature balancing (not a technical phrase) at Amazon, where they also have the new condition Phiaton MS 300 BA in-ears on sale for the very specific price of $55.52 with free shipping. Limit up to three units per customer here as well. Only the black color scheme is on sale thusly. There’s only one customer review, so check elsewhere if you are not familiar with these. If you are a fan of balanced armature earphones, the new condition Phiaton MS 100 BA are on sale for $40 with free shipping, with a limit of up to three units per customer at Amazon by Amazon actual where they average 4.1 out of 5 based on 38 customer reviews. Another one of the Dunu offers at NewEgg Flash that are shipping from Shenzhen Audio in Asia are now price-matched by a “fulfilled by Amazon” seller, Singapore’s Lend Me UR Ears has fulfilled by Amazon new condition DUNU DN-2000 Hybrid 3-way in-ears (two BA and one dynamic drivers) for $248 with free 2-day shipping for Prime shipping (or the usual SuperSaver shipping for non-Prime members). What is not price-matched however, and not shipping from the USA is the new condition Dunu DN-2000J 3-way (two BA, one dynamic drivers) going for $260 with free shipping by Shenzhenaudio through New Egg Flash. This offer ends Sunday night. It’s balanced armature time! The new condition Phiaton MS 100 BA earphones are on sale for $40 with free shipping at NewEgg actual (ends Monday night; no promo code needed) and at Amazon actual (limit 3) where it “ships within 1-3 weeks” and averages 4 out of 5 based on 37 customer reviews. The Phiaton MS300 BA earphones are offered in open-box condition by NewEgg actual with a limit of one unit per customer. NewEgg does not guarantee the inclusion of any accessories with open-box purchases. 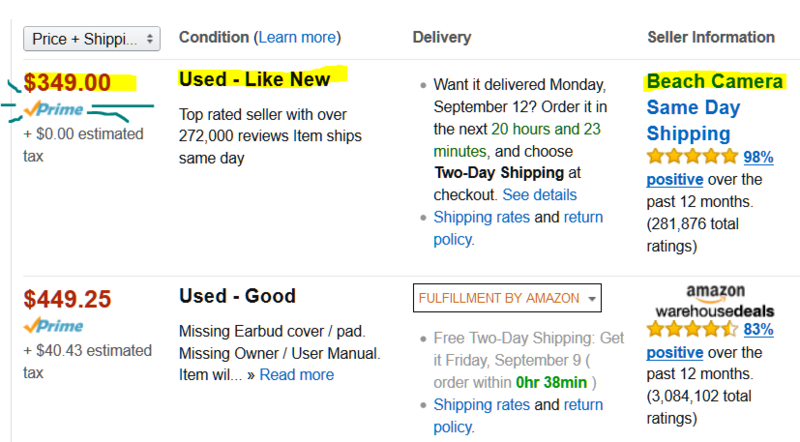 If you prefer new condition, it goes for $65~ by Amazon actual where it only has one review. Or it goes for $60 shipping directly from Electronics Expo. For a limited time only, the new condition Westone UM3X 3-Way in-ears are on sale for $250 with free standard shipping at B&H Photo. These have three balanced armature drivers. The Sony XBA-Z5 In-Ears are currently available in “Used – Like New” condition for $349 with free shipping by Beach Camera thru Amazon. They ship directly from Beach Camera but Prime members will get free 2-day Prime shipping as the Prime logo next to the price suggests. As the BA in the name suggests, these are balanced armature earphones. Don’t call them Fiat, they are Phiaton 🙂 The Phiaton MS 100 balanced armature earphones are currently down to $49 with free shipping with a limit of five units per customer at Amazon by Amazon actual where they average 4.2 out of 5 based on nearly 50 customer reviews. We now plainly break the plane of the planars with an in-ear option. The official Best Buy eBay store is offering the new condition Sony XBA-H1 in-ears for $75 with free shipping or free store pickup with a limit of five per customer. As the “BA” in their model name gently hints at, these “are” balanced armature. The NuForce HEM8 Reference Class in-ears with their quad balanced armature drivers go for $500 in new condition at authorized dealers but if you want to buy them now and want to save some, you can get them in “Used – Very Good” condition (cosmetic imperfections, damaged original packaging) for $399~ by Amazon Warehouse Deals. The “BA” is unmistakable in the model name, it’s balanced armature time, the Sony XBA H3 Hybrid 3-way In-Ears have many listings at Amazon Warehouse Deals (AWD). The lowest price is currently $175 in “Used – Good” with many more listings for $187~ in “Used – Very Good”. It looks like there is price pressure on them, perhaps that one “Used – Good” may be the dam that is holding back the discounting. Even if this price is not right, you may want to keep an eye out for them in case of future discounts (not guaranteed that they will drop further though ~ speculation based on patterns). The MeElectronics A151P Balanced Armature In-Ears go for $40 in new condition but if you want to save some more, you can get them in “Used – Very Good” condition for around $26 by Amazon Warehouse Deals. If you are fond of balanced armature earphones, the MEelectronics A151 are on sale at Amazon.com by Amazon actual for $35 (without mic) or $40 (with mic), with a limit of five per option per customer. They average 3.7 out of 5 based on 275 customer reviews. If you need additional or replacement eartips, you can get them by size or as a bundle through MEelectronics’s eBay store.